By Chris Williams: Former three division world champion Juan Manuel Marquez (53-5-1, 39 KO’s) realizes that in order for him to be guaranteed of a win over WBO welterweight champion Manny Pacquiao (53-3-2, 38 KO’s) he may have to knock the Filipino out on November 12th at the MGM Grand in Las Vegas, Nevada. It’s kind of sad that the soon to b 38-year-old Marquez has to win by KO just to get the ‘W’, but that’s probably the reality of it. Marquez didn’t get the decision in his two previous fights with Pacquiao, even though he appeared to win both fights in the eyes of many boxing fans. I certainly had Marquez winning both fights, but it kind of shows you how tough it is to beat Pacquiao. You got to beat him badly if you want to win a decision, and the best way is to simply take the judges out of the mix by knocking him out. Marquez has the best tools to accomplish that with his excellent body punching. If there’s an area where Pacquiao is vulnerable it’s to the body. You look as his fight with Antonio Margarito and in some of his other fights, and that’s where he’s been hurt before. 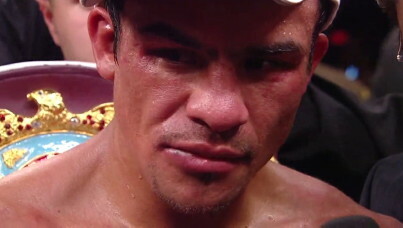 Marquez needs to double triple up on his hooks to the liver to take Pacquiao out. You got to pound his body and then come up with a good plan to defeat his grabbing once he makes it back to his feet. His trainer Freddie Roach no doubt has come up with a survival plan for Pacquiao to use when and if he gets hurt. You can expect a load of clinching. Marquez needs to continue to blast Pacquiao in the bread basket even while being held.